1/35: Seahouse Escape - A terrific beach house in Crystal Beach, Destin, Florida. 2/35: Nice front porch invites you to spend quality time relaxing when not on the beach. 15/35: Private queen bedroom on 1st floor of main house. 16/35: Private queen bedroom on 1st floor of main house. 17/35: Full bath on 1st floor of main house. 18/35: Huge master bedroom on 2nd floor of main house with front deck access. 22/35: Huge master bedroom on 2nd floor of main house with private large master bath. 26/35: Since photo, we`ve added a FOOSBALL TABLE & SMART TV to this bunk room. 27/35: Full private bath for 2nd floor bunk room in the main house. 28/35: Nice pool and carriage house in back yard. 29/35: Living area with kitchenette and HDTV in carriage house. 30/35: Living area with kitchenette and HDTV in carriage house. 31/35: Living area with kitchenette and HDTV in carriage house, queen sleeper sofa. 33/35: Private king bedroom in carriage house. 34/35: Private king bedroom in carriage house. This is a great home for 2-3 families with children or small groups of 10-12 adults max. You’ll immediately shift into beach vacation mode when you step inside Seahouse Escape. 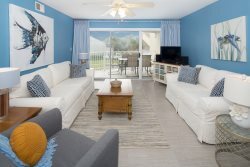 The new beach-inspired colors, furniture and décor, as well as the comfortable, open rooms invite you relax and enjoy seaside living. And the pristine white beach is only about a block away! Plus, your rental includes a complimentary 4-passenger golf cart - great for getting around this beautiful beach community! This well-appointed home, with a private carriage house (AKA guest house), features a total of 4 Bedrooms - 3 master bedrooms (2 kings and 1 queen) and a super bunk room with a queen bed plus 2 sets twin-over-full bunk beds (5 beds total in this room). You’ll also appreciate the bright, open kitchen and large dining and bar area, as well as 4 full bathrooms. You’ll enjoy the lovely private pool and deck area next to the carriage house, as well as a covered area for grilling and outdoor dining. We keep our home clean and well-updated, and pay attention to amenities you'll need, such as high-speed internet, nice flat-screen TVs, high-definition cable, hair dryers in each bathroom and more. We also provide items our smaller guests may need like a high chair and pack-n-play. You’ll love the spacious, open floor plan of the main house with tile floors, plenty of comfortable seating in the living area and a large flat screen TV with DVR/Blu Ray. The dining table seats 8 in beautiful rattan chairs, with additional seating for 4 at the breakfast bar. You’ll enjoy cooking in the bright, open kitchen with plenty of counter space and new Stainless Steel appliances. You’ll find all the dishes, pans and utensils you may need, a Keurig D-Cup coffee maker, crock pot and even a few spices, to get you started. We want you to feel at home, and the large, open layout is a perfect gathering spot for your family or friends. For the convenience of our guests, we have also included a full-size washer and dryer in a large laundry area off the kitchen. It’s enclosed in an extra-large closet, with storage space for items you like to bring to the beach. You’ll also find an iron, ironing board, broom, and a few cleaning supplies. Down the extra-wide hallway on the main floor is this comfortable, private bedroom that features a QUEEN BED with a new quilt, super-soft Egyptian cotton sheets, a bedside table with reading lamp and a flat-screen TV. There’s a dresser and double closets for plenty of storage. Coordinating draperies allow for extra privacy or a little less light if you’d like to sleep in or enjoy an afternoon nap during your stay. The well-appointed, full bathroom is adjacent to this bedroom. This spacious bathroom on the 1st floor features a commode, large vanity with sink and drawers and a tub/shower combination. You’ll also find large, fluffy bath towels and a personal hair dryer in this bathroom. The extra-large King Master bedroom is upstairs and features a KING BED with a brand new quilt and super-soft Egyptian cotton sheets, a large rattan armoire, and a flat-screen TV. From this room, you can step out to your private second floor deck to enjoy your morning coffee or relax after a day at the beach. There are two large bedside tables with reading lamps, if you’d like to curl up with a good book. You’ll also appreciate the walk-in closet in the attached private bathroom. This roomy bathroom features an extra-large vanity with double sinks and drawers, a linen closet, commode, bathtub and separate shower. You’ll appreciate the size and convenience of this bathroom, as well as the big, fluffy bath towels and personal hair dryer. Down the wide hallway from the Master Bedroom, this super-size bunk room features 2 sets of TWIN-over-FULL bunks and a QUEEN BED (5 beds total in this room! ), so there’s room for up to 8 children, or 6 adults. Everyone will love having this space to hang out when they’re not outside enjoying the Destin sunshine. There's a new SMART TV for indoor fun too. The bunk room also has its own private full bath. This bathroom, attached to the Bunk Room, is equipped with a commode, vanity with sink and tub/shower combination. There is also a personal hair dryer and large fluffy bath towels for the Bunk Room guests. This lovely Carriage House is next to the private pool behind the main house. Inside you’ll find a comfortable living area with a queen sleeper sofa, a flat screen TV and small dining table and chairs – a perfect place for a quiet cup of coffee in the morning or snacks when taking a break from swimming. The kitchenette is equipped with a refrigerator, coffee maker & microwave. There's also a King Master Bedroom and full bathroom. The lucky guests who stay in the private carriage house will enjoy a beautiful KING BED with a brand new cotton quilt, 100% Egyptian cotton sheets, two night tables with reading lamps and a huge walk-in closet. There is also an armoire with a TV and extra storage space. You’ll find having a bathroom in the carriage house is so convenient when you’re out at the pool! This bathroom includes a commode, sink and tub/shower combination. You’ll also find a personal hair dryer and big, fluffy bath towels. Your group can relax and enjoy the beautiful Destin sunshine in the 12 x 24 ft. pool surrounded by a spacious deck and beautifully landscaped private back yard. There’s plenty of seating, including an updated dining table for 6 with a tile top and umbrella, as well as a bistro table and chairs on the covered deck next to the back door. A gas grill is right there too for easy cookouts by the pool. For your little children, there are child safety gates to the pool deck from both the main house and the carriage house. Pool heat is available for an additional fee. This home has a large driveway which accommodates 3-4 vehicles (depending on the size of the cars) . There is no on-street parking allowed in Destin. The home is about a block from the beach; you can choose between two access points: Shirah Street or the larger ‘Shore at Crystal Beach Park’ with a pavilion and bathrooms. At the house, you’ll find a cart with beach chairs and an umbrella, so you can roll your gear to the beach with ease. Crystal Beach is the gold standard of Destin...no high-rise condominiums. It’s mostly residential, which contributes to the quietness of the neighborhood – you can just stroll down the sidewalk to the beach, or walk to a few nearby restaurants or shops. Restaurants, activities and entertainment are also close-by. Destin Commons, a beautiful upscale shopping and entertainment center, is less than a half-mile away. It features over 75 shops and restaurants, including Bass Pro Shop, World of Beer, Panera Bread, Uncle Buck's Fish Bowl & Grill, AMC Theater with IMAX and much more. Local favorite, Camille’s, is an easy walk around the corner and The Crab Trap is about a mile east. You can bicycle, scooter, Jet ski and go para-sailing all within walking distance. The Silver Sands Outlet mall is not far for those who enjoy “retail therapy”! We know how difficult it is to find a vacation rental to suit your family’s needs, schedules and budget. We’re happy to assist you with the process of finding and booking the right place to stay for your vacation. We don’t leave you hanging—we actually answer our phone and do our best to get back to all email inquiries within an hour (and if you put your phone number into the inquiry form, we will call you)! Unlike many other people who never update their calendars, we always keep ours up-to-date. The members of the team are professional and friendly; there to help whenever you need them. The donuts from the Donut Hole that were waiting for us upon our arrival were a personal touch and hit the spot after traveling! Yum! This vacation was one of the best trips we have taken. The colors and furnishings in the house were inviting and comfortable. The pool was just the thing needed after a day at the beach. We enjoyed making our meals in the kitchen...the open floor plan kept us all together. The layout of the house accommodated all of us easily. We enjoyed sitting on the porch and balcony in the evening to unwind. Destin is one of the most beautiful places we have ever seen!! Thank you Sugar Palm for making it special! The donuts and personalized postcard, along with a visit from Jeff upon arrival, were all nice touches. We have been staying in Crystal Beach for 8 years, and this is a very nice property that worked well for us. We have stayed in this property for two years and loved the new beachy paint in the living area and kitchen and the enlarged patio area. The beach cart with chairs and an extra-large umbrella was a welcome surprise. Jeff was wonderful! Extremely laid back & flexible! He made the entire process of reservations, check in, check out, etc basically effortless for me! The house was exactly as I expected! Location was perfect for shopping, dining, & going to the beach! The private pool is a great added bonus! There was more than enough room for everyone to sleep comfortably! Team was extremely attentive and courteous. Jeff even stopped by to say hello when we arrived. Property was recently renovated, in great condition, and as advertised. Sugar Palm staff was very easy to deal with. Overall, the property met or exceeded expectations and was a great value.